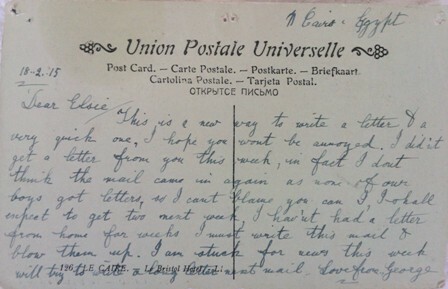 It’s Anzac Day today, and here’s a postcard written in February 1915 in Cairo, 99 years ago. I’ve had this card with me for years, and it’s lovely to share it with you now. I hope that George (the writer) and Elsie (the recipient) are smiling kindly, somewhere under a sky full of blue, at being remembered this way. 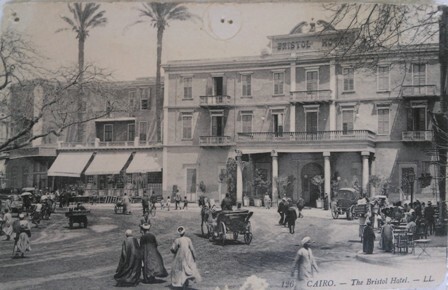 Here’s the front: the Bristol Hotel, Cairo, which opened in the late 19th century, and closed probably in the 1940s. And here’s George’s message to Elsie, on the back. George’s words to Elsie echo what we all write on postcards when we’re far from home and, at that very moment, can’t think what on earth to write about!